Are You a Good Candidate for a Voice Lift? Laryngoplasty – also known as a voice lift of voice augmentation — is a surgical procedure that combats age-related changes in the voice box by tightening the vocal cords. It’s like a face-lift, but for your voice! So why would you want to get a voice lift? Well, just like every other part of the body, the vocal cords also show signs of aging. Because they’re made from the same things your facial skin is made of – collagen, fat and muscle – the vocal cords get weaker as you grow older. Just like the skin on your face, the vocal cords thin, atrophy and wrinkle, and as time goes by they begin to under-perform, causing your voice to sound older. A variety of factors can contribute to the voice aging, including genetics and overall health and lifestyle factors like smoking and heavy drinking. Some diseases and medical conditions may also contribute to premature voice aging, causing hoarseness and a lack of vocal range. Doctors and voice specialists can use injectable fillers – the same products used to erase wrinkles and tighten facial features – to bring the vocal cords closer together and make them more limber. Implants can also be introduced through incisions performed in the neck, bringing the vocal folds closer together. The procedure creates a greater “strike” against the vocal cords, which can effectively produce a stronger, louder voice output. The result? A younger, clearer voice that makes you sound – and feel – like you did years ago. Voice lift surgery is relatively non-invasive and easy to perform. It used to be that laryngologists were the only ones who could perform the surgical procedure, but now there are options available in the same places where you get regular skin injections. In fact, more and more cosmetic surgeons are providing the service in-office, making it as convenient, safe and simple as routine face or lip injections. 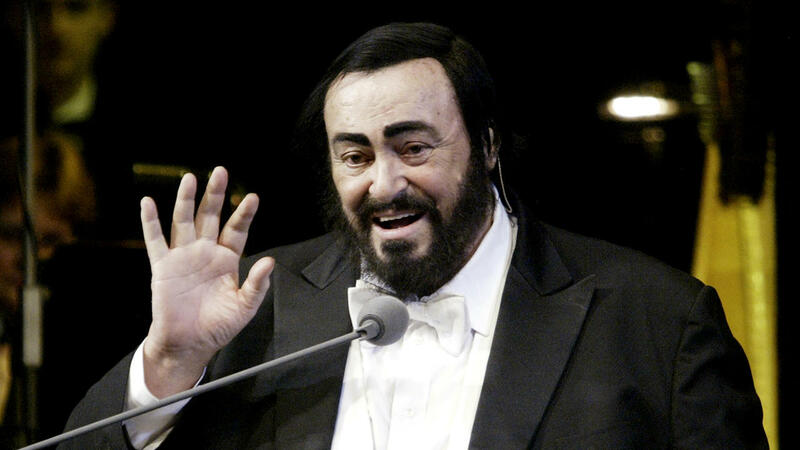 Italian Opera singer Luciano Pavarotti. Surgery to tighten the vocal cords is a relatively new option in the realm of cosmetic procedures. In fact, the term “voice lift” was first coined in a 2004 interview on the subject by the Professor and Chair of Otolaryngology at Drexel University of Medicine, Dr. Robert Thayer Sataloff — one of the leading doctors and researchers in the vocal rejuvenation realm. That being said, voice lifts have been used for non-cosmetic reasons for years. For example, voice surgery can treat vocal cord paralysis or weakness in the vocal cords, often the result of conditions like thyroid surgery. Houston-based Dr. Richard C. Stasney is credited with pioneering the fat-injection technique to help revitalize paralyzed vocal cords over three decades ago. Stasney – who went on to treat opera singer Luciano Pavarotti and other big-name acts – then created the Texas Voice Center, which provides medical services and also helps contribute to some of the more significant vocal rejuvenation research out there. The procedure Stasney invented, which was subsequently named after him, is still used today. Since Dr. Sataloff inadvertently coined the phrase, many members of the general public have become interested in voice lifts, encouraging doctors and researchers to quickly develop new methods to make the procedure safer and more affordable. Consequently, you can now get office-based injections into one or both vocal folds to improve the performance and production of your voice. You might also want to consider inpatient vocal lift surgeries, depending on your unique needs. This is one of the simplest ways to give your vocal cords an age-fighting boost. Doctors inject fat or collagen into the vocal cords so that they move more easily, making the voice sounds younger. Essentially, the procedure is quite similar to standard filler injections. After getting these injections you may experience subtle voice tightness for a few days or a week. Vocal cord injections are the best option for those seeking minimal to no recovery period. Injections are a good choice over implants, as they take less than 30 minutes and can be performed in-office, with no surgery required. Additionally, doctors are able to perform these injections without sedation, so patients can drive themselves home afterward. With that being said, filler injections don’t last as long as the implant option. Those who have experienced voice aging or vocal cord paralysis (VCP) are good candidates for laryngoplasty, or implant-based voice lifts. This is done by moving the vocal fold margins or introducing an implant in order to improve the quality of the voice. The procedure is relatively simple: it typically takes only 15 minutes, and the patient is generally able to eat right away following surgery. These tiny implants, which are made of silicon or Gore-Tex, last longer than injection-based fillers. With that being said, medialization laryngoplasty requires anesthesia, so it’s a more complex recovery process. If you’re self-conscious about the way your voice has aged or if your voice has started to exhibit more rasp, then you may be a good candidate for vocal rejuvenation. Quiet vocal characteristics, vocal weakness and voice disorders can be aided by this procedure and voice therapy options. Additionally, singers and voice actors commonly undergo voice lifts — their voice is their most important physical attribute, after all — as well as those who spend several hours a day talking on the phone or in front of large crowds. Many performers, lawyers, doctors, professors, politicians and public speakers undergo voice rejuvenation procedures each year. This high-level treatment tends to be most popular among baby boomers and older generations, but is suitable for patients at any age. If you have experienced medical conditions such as vocal cord paralysis, granulomas of the vocal cords (ulcerous masses that can interfere with voice output), laryngeal tremors, vocal fold nodules, spasmodic dysphonia or Reinke’s Edema (large vocal folds that occur in female smokers, triggering a low-pitched or raspy vocal quality), then you will benefit from a voice lift procedure as well. Because injection laryngoplasty is a relatively simple procedure, it is commonly recommended for both cosmetic and medical purposes. If you feel that you have vocal weakness or are experiencing signs of voice disorders, then you can get a medical diagnosis before treatment. However, you can also get a voice lift for cosmetic purposes only, if desired. You may experience more severe side effects if you opt for medialization laryngoplasty over injection laryngoplasty. When you choose the medialization method, there’s a good chance your doctor will want to keep you in the hospital overnight to observe any changes. As with any surgery, medialization laryngoplasty can cause infection, bleeding and the rare but possible risk of the implant moving or extruding the airway. Risks associated with anesthesia are also present, including nausea, vomiting, sore throat, confusion, muscle aches, itching and rare conditions such as delirium, cognitive dysfunction and more. It’s important to note that most people have no issues with anesthesia, but there’s still some risk. Some laryngoplasty patients have also reported breathing difficulties and excessive bleeding. Injection laryngoplasty – which is usually done using the same bovine (cow) collagen and other treatments that are used to tighten facial skin – may cause fewer side effects than the medialization option. Because the injection method doesn’t require anesthesia, post-treatment symptoms and side effects are significantly reduced. With that being said, some patients report tightness in the voice and experience certain voice changes, such as squeakiness or a whispery voice, after receiving vocal cord injections. Allergic reactions are also a possibility. As with all procedures, it’s essential that you discuss side effects, recovery and medications with your doctor beforehand.